Damages Recoverable in Illinois for Hospital Violation of Do Not Resuscitate Order. It does happen. A family member with a long history of illness signs a “Do Not Resuscitate Order” expressing his or her wish not to be revived if they go into cardiac arrest. In our client’s case, the Hospital resuscitated the patient after he went into cardiac arrest, despite the fact that the Hospital had received our client’s valid DNR Order 34 hours earlier. 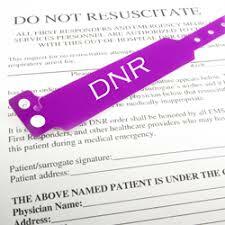 The DNR Order never made it from the emergency room to the patient’s hospital room. As a result of the hospital’s negligence, our client was resuscitated against his wishes. Recently, the hospital paid our client a substantial settlement for violating the DNR order. Hospitals are required by law to ask for any advance directive, such as a DNR, and are required to enter the DNR into the patient’s medical record upon admission. This blog post highlights some of the damage claims that can be asserted under Illinois law when these horrific mistakes happen. Under Illinois law, “[a] battery is the unauthorized touching of the person of another.” Fiala v. Bickford Senior Living Group, LLC, 2015 IL App (2d) 150067 at ¶ 21 (2015) (citing cases). Battery is an intentional tort and the element of intent is defined as either an intent to touch, or an intent to harm or offend by the touch. Id. “In medical battery, hostile intent on the part of the defendant need not be established; rather, the gravamen of the medical battery focuses on the plaintiff’s consent. Id. “Thus, in a medical battery case, the plaintiff may recover by establishing “a total lack of consent to the procedure performed, that the treatment was contrary to the patient’s will, or that the treatment was at substantial variance with the consent granted.” Id. “Furthermore, because a physician must obtain consent from a patient prior to initiating medical treatment, it is logical that the patient has a common law right to withhold consent and thus refuse treatment. This right incorporates all types of medical treatment, including life-saving or life-sustaining procedures.” In re Estate of Longeway, 133 Ill. 2d 33, 45 (1989). To state a medical battery claim, a plaintiff only needs to prove that (1) there was no consent to the medical treatment performed; (2) the medical treatment performed was against the injured party’s will; or (3) the medical treatment performed varied substantially from the consent actually granted. Fiala, 2015 IL App (2d) 150067 at ¶ 26; see also, Sekerez v. Rush Univ. Med. Ctr., 2011 IL App (1st) 090889 at ¶ 43-9 (2011) (reviewing elements of claim and reversing directed verdict for hospital on medical battery claim). Under any of these circumstances, a battery has occurred, because the person administering the medical treatment touched the person of another without authorization. Id. The lack of consent to the medical treatment is the focus, not the intent of the person administering the medical treatment. Id. ; see also, Gragg v. Calandra, 297 Ill. App. 3d 639, 645-46 (2nd Dist. 1998) (complaint alleging that hospital operated on patient without consent and maintained him on life support against the wishes expressed in his living will violated plaintiff’s right to bodily and personal integrity and constituted medical battery); Guebard v. Jabaay, 117 Ill. App. 3d 1, 7 (2nd Dist. 1983) (holding that where an unauthorized surgeon operates, he commits a technical trespass to the patient resulting in the intentional tort of battery); Grant v. Petroff, 291 Ill. App. 3d 795, 804-805 (5th Dist. 1997) (distinguishing medical battery from negligence claim for medical malpractice). Moreover, “[t]he law infers damages when any trespass on the person of another is committed. It infers bodily pain and suffering from such an act, and allows damages for them, however difficult they may be of ascertainment or apportionment.” Pratt v. Davis, 118 Ill. App. 161, 181 (1st Dist. 1905)(affirming trial court award of damages for surgeon’s unauthorized removal of patient’s uterus). In addition, the Hospital’s outrageous conduct subjects it to liability for punitive damages in a medical battery case. Fiala, 2015 IL App (2d) 150067 at ¶ 50-59 (reversing trial court decision striking request for punitive damages on medical battery claim and allowing punitive damage claim to proceed); Happel v. Wal-Mart Stores, Inc., 319 F. Supp. 2d 883, 886 (N.D. Ill. 2004) (recognizing that punitive damages may be awarded in medical battery claims). In a DNR violation case, a hospital can be liable for medical battery. In our client’s case, the DNR Order specifically informed the Hospital and its medical staff that the patient did not want to be resuscitated, that he did not want intubation, that he did not want mechanical ventilation and that he did not want to be intubated in an intensive care unit. Thus, our client never consented to these procedures. By violating the DNR Order, and performing unwanted medical services, a hospital also can be liable to the client for invasion of privacy, also known as the tort of intrusion upon seclusion. In 2012, the Illinois Supreme Court formally recognized this as a viable cause of action in Illinois. Lawlor v. N. Am. Corp. of Ill., 2012 IL 112530, at ¶¶ 34-35 (Ill. 2012); see also, Schmidt v. Ameritech Ill., 329 Ill. App. 3d 1020, 1030 (1st Dist. 2002); Restatement (Second) of Torts, § 652B, at 378 (1977) (“One who intentionally intrudes, physically or otherwise, upon the solitude or seclusion of another or his private affairs or concerns, is subject to liability to the other for invasion of his privacy, if the intrusion would be highly offensive to a reasonable person.”). In Leopold v. Levin, 45 Ill. 2d 434, 440-41 (1970), the Illinois Supreme Court held that “[p]rivacy is one of the sensitive and necessary human values and undeniably there are circumstances under which it should enjoy the protection of law.” In Leopold, the Court referred to the right of privacy as one recognized many years ago and “described in a limited fashion by Judge Cooley with utter simplicity as the right ‘to be let alone.’” Id. at 440. In the DNR context, the patient desires to be left alone if he went into cardiac arrest, and the Hospital may be subject to liability for disregarding the DNR Order that expressed that desire clearly and unequivocally. Before the turn of the 19th century, the United States Supreme Court observed that “no right is held more sacred, or is more carefully guarded, by the common law, than the right of every individual to the possession and control of his own person, free from all restraint or interference of others, unless by clear and unquestionable authority of law.” Cruzan v. Dir., Mo. Dep’t of Health, 497 U.S. 261, 269 (1990) (quoting Union Pacific R. Co. v. Botsford, 141 U.S. 250, 251 (1891)). This notion of bodily integrity has been embodied in the requirement that informed consent is generally required for medical treatment. Id. ; see also, Mills v. Rogers, 457 U.S. 291, 294, n.4 (1982) (“The right to refuse any medical treatment emerged from the doctrines of trespass and battery, which were applied to unauthorized touchings by a physician”). For this reason, an equivalent claim is for common law trespass. Pratt, 118 Ill. App. at 181. “[I]t is elementary that for any trespass on the person, some damages are inferred by the law.” Pratt, 118 Ill. App. at 173. A DNR violation can potentially support a claim for invasion of privacy based upon the hospital’s intrusion upon the seclusion of the patient because (1) the Hospital’s act of rendering unwanted medical services constituted an unauthorized intrusion or prying into the patient’s seclusion; (2) a reasonable person would find the the Hospital’s conduct offensive or objectionable because the Hospital’s physical intrusion into the patient’s body specifically violated the DNR Order that the Hospital had possession of; (3) the matter upon which the intrusion occurs is private, as noted above; and (4) the intrusion caused anguish and suffering to the patient. The hospital also can be liable to family members who are in the vicinity of the patient when he or she is resuscitated. This claim, known as reckless infliction of emotional distress, can be supported by arguing that (1) the hospital’s conduct was extreme and outrageous, (2) the Hospital knew that there was a high probability that its conduct would cause severe emotional distress to the family, and (3) the Hospital’s conduct in fact caused severe emotional distress to the family. Eid v. Loyola Univ. Med. Ctr., 2016 IL App (1st) 143967 (Dec. 2, 2016); Doe v. Calumet City, 161 Ill.2d 374, 392 (1994) (allowing claim); Kolegas v. Heftel Broadcasting Corp., 154 Ill. 2d 1, 20-25 (Ill. 1992) (allowing claim); McGrath v. Fahey, 126 Ill. 2d 78, 93 (1988) (allowing claim). The law recognizes that extreme and outrageous conduct may arise from an abuse by the actor of a position, or a relation with the other, which gives him actual or apparent authority over the other, or power to affect his interests. McGrath, 126 Ill. 2d at 86-87; Restatement (Second) of Torts, § 46, cmt. e.
Severe emotional distress is defined to include “mental suffering, mental anguish, mental or nervous shock” as well as “highly unpleasant mental reactions, such as horror, grief, shame, humiliation, embarrassment, anger, chagrin, disappointment, worry, and nausea.” Restatement (Second) of Torts, § 46, cmt. j. Damages for emotional distress are not limited to cases in which the plaintiff has suffered bodily harm. Id. at cmt. k. Where the conduct is sufficiently extreme and outrageous, liability can be predicated upon the emotional distress alone, without providing bodily harm. Id. Evidence regarding the severe emotional distress caused by end of life decisions has been documented time and time again, and is easily proven. Each of the claims set forth above allow for the potential recovery of punitive damages. In Lawlor, 2012 IL 112530, at ¶ 65 , the Illinois Supreme Court affirmed a jury verdict for intrusion upon the seclusion by a former employer into a former employee’s telephone records. The Court ultimately allowed $65,000 in compensatory damages and $65,000 in punitive damages, reducing the jury’s $1.75 million punitive damage award. In Lawlor, the Court acknowledged that the wrongful conduct of the former employer was “de minimus, fairly much, on all criteria.” Id. at ¶ 65. The United States Supreme Court has held that punitive damages should bear a “reasonable relationship” to actual damages. BMW of North America, Inc. v. Gore, 116 S.Ct. 1589, 580 (1996). There is no magic ratio, however, between the maximum permissible punitive damages and compensatory damages, and juries have wide discretion when deciding whether punitive damages should be awarded. TXO Prod. Corp. v Alliance Resources, 113 S.Ct. 2711, 2722-23 (1993) (affirming $10 million punitive damage award that accompanied an actual damage award of only $19,000 – a ratio of 526 to 1). Illinois courts also have upheld large punitive damage awards. See Dubey v. Public Storage, Inc., 395 Ill. App. 3d 342, 358 (1st Dist. 2009) (affirming award of punitive damages at one hundred forty-nine (149) times compensatory damages on conversion claim); Turner v. Firstar Bank, N.A., 363 Ill. App. 3d 1150, 1165-66 (5th Dist. 2006) (allowing punitive damages of $225,000 on compensatory damage award of $25,000 (9 to 1 ratio)); Int’l Union of Oper. Engineers, Local 150 v. Lowe Excavating Co., 225 Ill.2d 456, 484 and 490 (2007) (allowing punitive damage ratio of 11 to 1 on compensatory damage claim of $4,680). The trial lawyers at DeBlasio & Gower LLC have the experience you need to face the most difficult challenges in court, including the Circuit Court of Cook County, the DuPage County Circuit Court in Wheaton and the Will County Circuit Court in Joliet. Strategically located with offices in Chicago and Oak Brook, we are located near the major circuit courts and major highways and interstates. Call us for a free evaluation of your injury claim at (630) 560.1123. www.DGLLC.net.